Product #22132 | SKU 20254 | 0.0 (no ratings yet) Thanks for your rating! 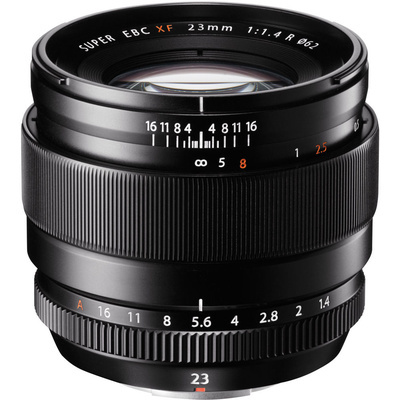 The Fujifilm XF 23mm f/1.4 R Lens is a prime wide-angle lens that provides a 35mm-equivalent focal length of 35mm, making it a suitable lens for everyday shooting. This all-around lens is further benefitted by the fast f/1.4 maximum aperture, which is especially useful in low-light conditions and for creating shallow depth of field and selective focus imagery. Also aiding in manual focus control are engraved camera-to-subject and depth of field scales on the barrel that help with setting the hyperfocal distance and pre-focusing techniques.